Hello! I’m busy working on Issue 8 of CraftSanity Magazine, but wanted to take a break to invite you to join me at Schuler Books, 2660 28th St. SE, in Grand Rapids on Monday, Oct. 29. 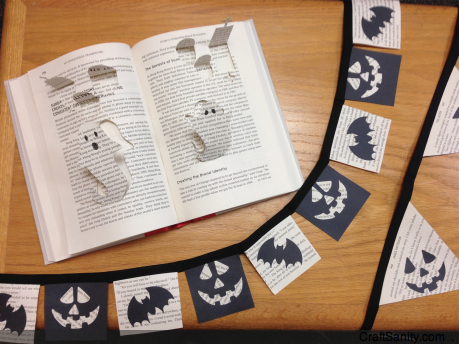 We will get our craft night rolling at 7 p.m. and plan to show attendees what you can make out of recycled books. Used books and other supplies will be provided, but feel free to bring your favorite tools from home. From home decor items to paper craft, we’ll be cutting and paper punching and glueing the night away. Due to the proximity to Halloween, we will have some spooky ideas to share like those pictured above. However, we will also be discussing how book crafts can be incorporated into winter holiday decorations, year-round decor and general craft projects. During this special community event, Schuler’s will also be stocking a full selection of all the CraftSanity Magazine back issues shown on the left side of this website. So if there’s an old issue you were looking to snag, head over to Schuler’s 28th Street location and they will hook you up. I’m very proud to say that I don’t sell my magazine at any big box, corporate stores. I could make more money if I did a massive print run and distributed nationally, but that has never been my goal. There’s something really satisfying about being small and homemade and partnering with independent craft shops and bookstores like Schuler’s. The experience of browsing the shelves at a local bookstore and hearing the great speakers that come to talk about their lives and sign books is one I value – an experience I can’t have when buying books online. So wherever you live, I hope you make a point to support your local bookstore from time to time. We all must do our part to keep them in business because local bookstores enrich our communities and inspire those of us who dream of writing our own books so very much. Congrats on 30 years, Schuler Books! P.S. Here’s the link to the Halloween craft segment that I did on WZZM Channel 13.